Home Social Enterprises Fire and Electrical Services Harley sets his sights on becoming a technician! Harley sets his sights on becoming a technician! 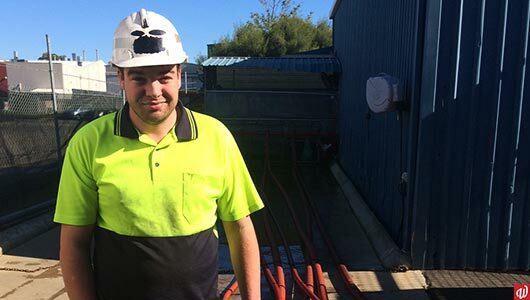 We’re delighted to share the progress of Harley: a smart and driven worker, who has shown incredible growth working with our technical mobile test bed in our Fire & Electrical Services division! Harley is a great supported worker, and it didn’t take long for others to notice. After only a month at the workshop, Harley was relocated to the mobile lay flat hose test bed for a trial period. This piece of complex machinery is used to perform a series of pressure tests on lay flat hoses. If the hoses fail the tests, they may need to be shortened, patched, or recoupled. These tasks are completed only by our trained technicians. As you can imagine, it’s not a simple job to learn. However, within the space of six months, Harley mastered the entire process! He’s blown everyone on the team away with his work ethic and dedication to improving his skills, especially Fire & Electrical Services Manager Zealan Simpkins. He’s now an integral part of the technical team, and has the potential to go far. Harley also assists the technicians on site visits for electrical testing and tagging. This is a wonderful opportunity to meet new people, expand his experience, and connect with the community. With a bit more training, Zealan believes he will be fully qualified for the job. Harley is looking forward to becoming a certified technician, and is keen to develop his career through training and experience. Congratulations Harley on all your hard work! We hope to see you continue to learn and build on your considerable skills. Our social enterprise businesses cover a range of industries and provide employment opportunities for people with disability. Call us on 1800 610 665 or contact us through email for more info.